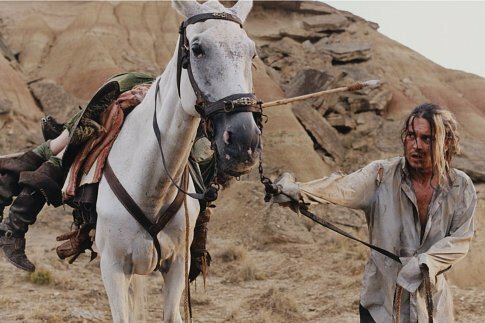 Johnny Depp tries to lead his horse in "Lost in La Mancha"
The wonder of YouTube (thanks safetymousejdtv) comes through again as we share with you this FOUR PART interview with Johnny Depp on his role in Terry Gilliam’s Lost in La Mancha. We bring this to you in anticipation of this Tuesday’s (October 18) screening of this Louis Pepe & Keith Fulton documentary which chronicles Gilliam’s futile attempt to bring the story of Don Quixote to the screen. Depp is his cool, introspective self, of course, as he shares some great movie nuggets on what it was like to work with Gilliam and his lunacy on the set, watching the film’s production fall apart, plus the future of the project and the “curse of Quixote.” Gilliam’s failed movie was TRULY the most remarkable film never made! Grab a seat, get comfortable, and hear all about Gilliam’s lost dream project from the star of the film himself. The entire interview is fascinating, but pay special attention to PART 3 as Depp goes into detail on the insanity of the unexpected flash flood the crew experienced on set. Ah, the movies … we absolutely LOVE ’em. This entry was posted in From the Lowell Film Collaborative, Lowell Film News, Lowell Screenings and Events, Movie Rants-N-Raves and tagged Johnny Depp, Keith Fulton, Lost in La Mancha, Lost in La Mancha Lowell, Louis Pepe, Lowell Film Collaborative, lowell film events. Bookmark the permalink.